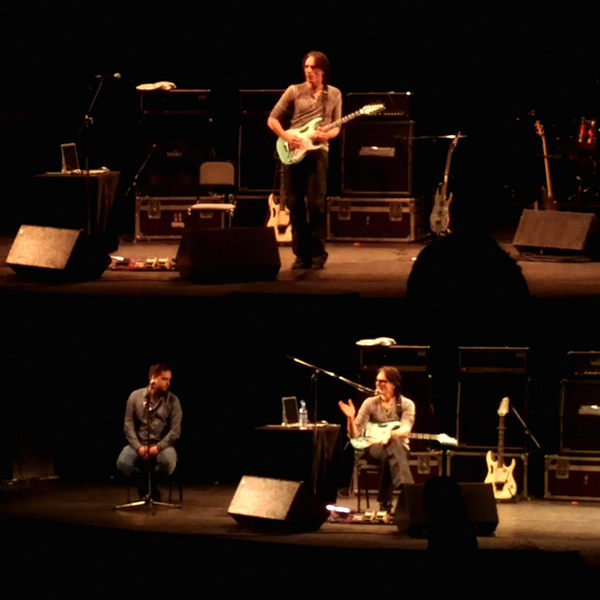 Did you attend this Alien Guitar Secrets Master Class at the TYZ Theatre? Thank you very much for coming to Omsk! Despite the fact that we had a very long wait, "Alien Guitar Secrets Masterclass" was interesting and very great! Steve told about himself, his childhood. About memorizing every Zappa's song, while his work with him. And also spoke about various techniques of guitar playing. In spite of the fact that I don't play on any kind of musical instruments, but I listened masterclass with great pleasure! Mr. Vai very nice guy, a lot of jokes and interacts well with the audience. And of course, Steve Vai's music is just amazing, as well as his impeccable guitar playing hypnotize the audience. But, unfortunately, the time fast very flew and I wanted more and more, despite the fact that the show lasted more than two hours. Come to Omsk again, we look forward new show. ...and hey ...I still want to get Steve Vai's autograph on my "Flex-Able Leftovers".